To confirm that you are a human which number is bigger, 2 or 8? How good is your eye sight? We have created a revolutionary pinhole card that has been specifically created to test just that. 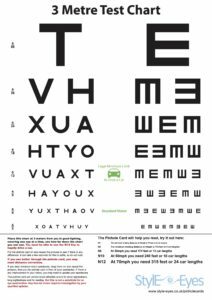 For the first time anyone can review their eye sight using our unique pinhole card using the eye test chart or 3 meter test chart. The pinhole business card has been created in a unique spectacle shape which are adjustable and can be tailored to your face. They offer businesses a unique opportunity to engage with their customers by allowing companies to test their employees/ clients eye sight using their own brand and contact details. Why not check out our video to learn more. Click Here to download the vision chart. Style Eyes will be donating some of the profits / proceeds of each sale to Eye Need sight which in turn will support Ophthalmic charities NGOs providing relief for the poor in the UK and Abroad. The amount donated will be available to inspect and who the receiving NGOs are and this will be published on a quarterly basis. 100% of the money donated to Eye Need Sight will be transferred to the other NGOs less any small administration costs which will be published.